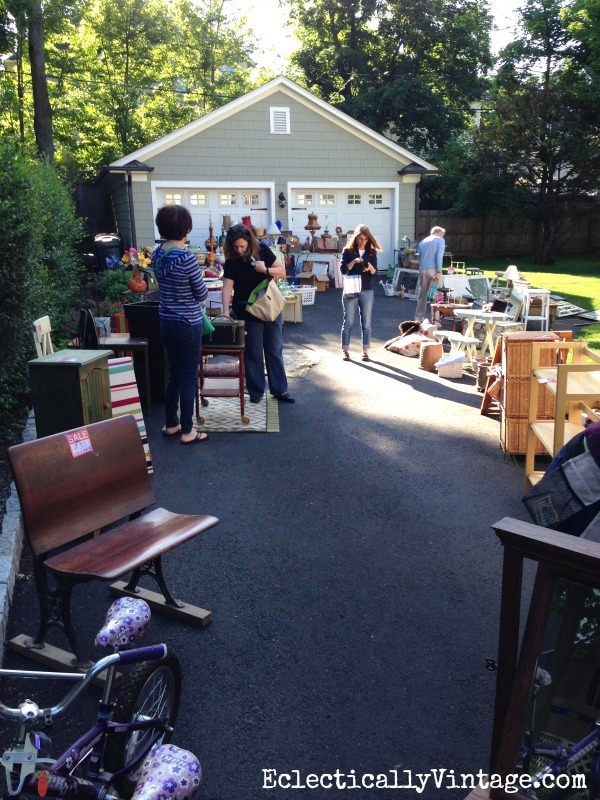 How to Throw a Killer Yard Sale - 15 Tips for Success! 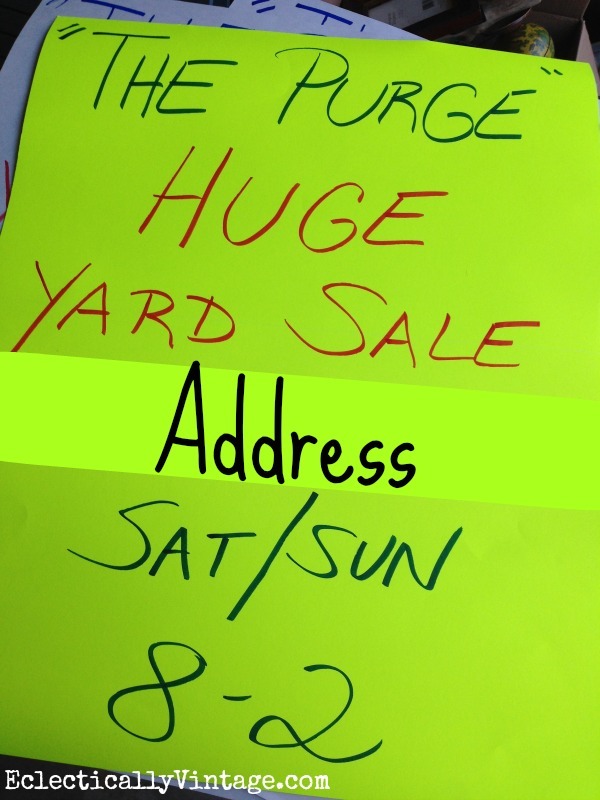 How to Throw a Killer Yard Sale – The Purge Sale 2014! It’s yard sale season! 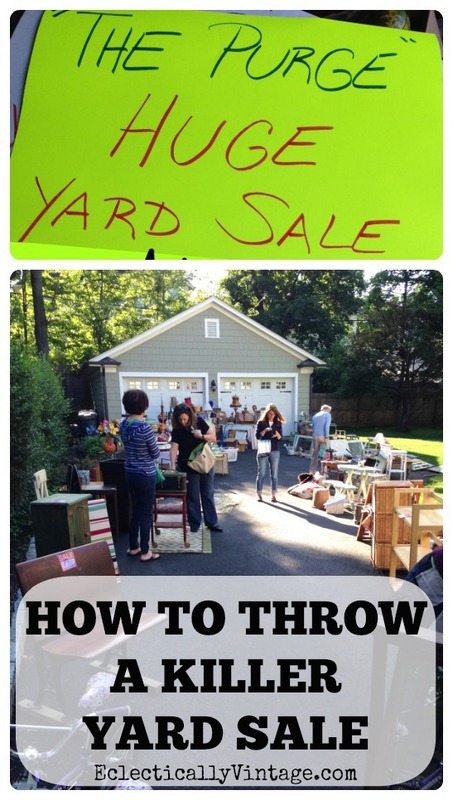 Read my tips on how to throw a killer yard sale! You’ll declutter your house and make money at the same time. 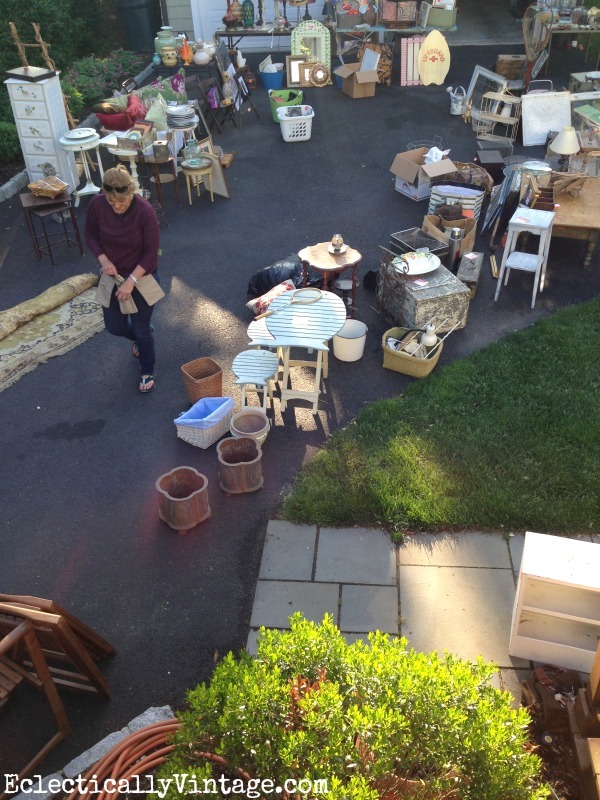 These tips will help you get the most out of your yard sale, garage sale or estate sale. Epic purge sale this weekend (May 31, June 1). Four hoarders (according to our husbands), teaming up to get rid of our stash so we can save our marriages. We love to shop, decorate, collect and roam the aisles of flea markets so you know our stuff is Amazing. The music will be pumping and the lemonade flowing so join us and help us get rid of our stash before we’re featured on the next episode of Hoarders. These pics are the tip of the iceberg – so much more! This is the ad that had people driving for miles just to see what a Purge Sale was! So much stuff from a crazy hoarder lady (that would be me), what else could it be called? I knew I needed an intervention when I descended my basement steps to get a carton of milk from our second fridge – only to find that I was tripping, falling and knocking things over left and right. and I had reached mine. I called my fellow hoarders – we were all in this together. We scoured our houses and left no bed, drawer, nook or cranny unturned in our quest to rid ourselves of clutter. How to Throw a Killer Yard Sale! 1) Enlist Friends – the more hoarders the better! If you have it (and lots of it), they will come – and spend money! 2) Purge – be ruthless. Go through closets, drawers, purses, nooks, crannies and everywhere in between and get rid of it. 3) Marketing – have your sale stand out with a clever ad (use words like multi-family) with lots of photos and vibrant signs. People told me they drove for miles because they loved my ad (patting myself on the back)! Put your ad on Craigslist a few days before the sale – mine got picked up by a yard sale app which drew in more customers. Tell everyone what the sale is about – ours was mainly household and vintage so people looking for clothes would know this wasn’t the sale for them. 4) Signs – size matters! Use one vibrant color poster board and make sure all signs look alike – then add smaller arrows as people get closer to your sale. You can never have enough signs – place them at major intersections around town where they’ll get noticed. 5) Prep – gather everything in one spot. I used my garage and filled it to the brim. My friends dropped off their stuff a day or two before the sale. 6) Merchandise – don’t throw your stuff around stuff willy nilly. Use tables, chairs and other cute props to make your sale seem feel like the Friends and Family sale at Nordstrom! When things sell, be sure to rearrange and shuffle the merchandise! 7) Display – make sure to put a few attention grabbing things near the curb so drive by’s know you’ve got great stuff. 8) Price to Sell – what’s your goal? If it’s to rid yourself of excess clutter, price things right. Anything really amazing should be put on Ebay or Craigslist. 9) Price Tags – since there were four of us selling our stuff, we each had different price tags so there would be no confusion as to who’s item it was. Mine were simple circle punched orange card stock stuck on with washi tape. 10) Price in Multiples – forget individually pricing multiples – make one big sign for a stack of books, purses, etc. 11) Money – make sure to have a roll of $1 bills handy for making change plus a few $5’s and $10’s (yes, people were paying with $100 bills). It’s not a fashion show and you’ll be moving around a lot so wear a fanny pack or apron or wristlet (what I used) to stash your cash. 12) Set the Mood – have upbeat music playing and recruit your kids to man a lemonade or cupcake stand. 13) Be Open to Negotiation – some people paid asking, most haggled (hard). The more they bought, the better the discounts. Slash prices as the day progresses – I removed all price tags and practically gave things away (most things were $1). 14) Let it Go – yes, someone may want to paint those antique iron planters a vibrant shade of pink (not kidding, someone was going to do that to my friend Jane’s planters – she cringed but sold them anyway)! 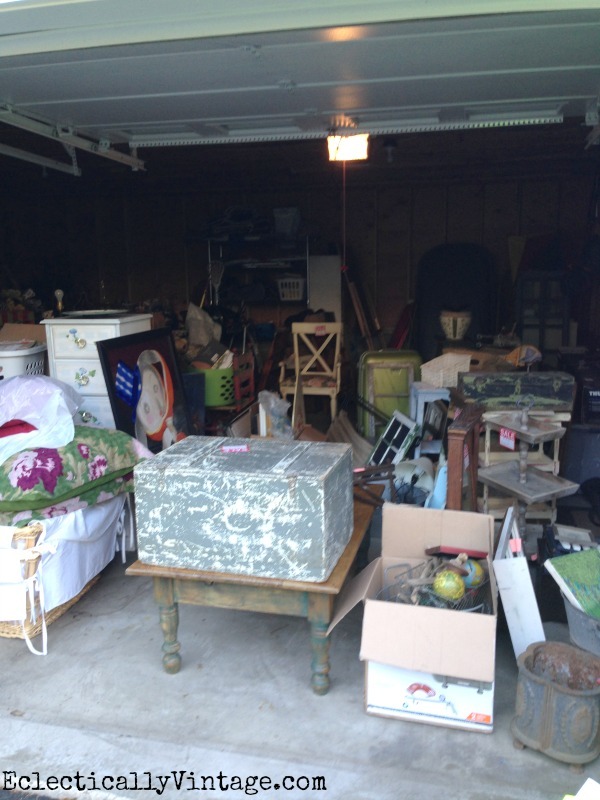 15) Clean Up – bring high ticket items that didn’t sell back inside to put on Ebay or Craigslist. Pile everything else up in the car and drive it to your nearest thrift shop or schedule a pick up. Get a tax slip so you can write off your donation. 16) No Regrets – be happy that you cleared out your piles and piles of stuff to make room to buy even more useless stuff you can sell at next year’s Purge Sale! What’s the best thing you ever scored at a yard sale? So funny my husband all of a sudden started throwing things out of a utility/storage room that was so full we could barely walk. Now it is all in the garage and his car is outside so now he has to take the stuff somewhere. I’m not doing a yard sale. At least I don’t think so. I also will be purging my hoarding room, too. Yep, one can only take it for so long. I would have definitely traveled miles after seeing that ad…looks like you had the coolest yard sale ever!!! 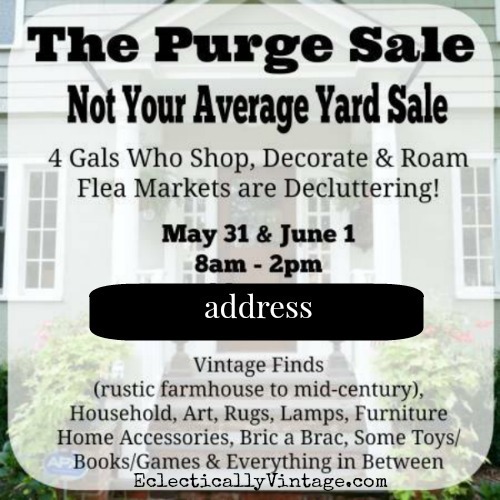 We are restricted in this neighborhood in having individual yard sales…so we have a community one twice a year…good to be able to get rid of things twice a year and the “leftovers” are picked up by Habitat…a good thing. I want that little old bench! We are currently in PURGE mode – we’ve sold our current home and are downsizing. We have had one mega sale already and are stacking up more stuff for another one next month…it’s amazing what you find when you are clearing out closets…congrats on your sale!! I wish I was your neighbor! My daughter and I love tag sales! Did anyone see the address of the sale? I can’t seem to find it! Thank you! Kelly, I will totally do this with you next time. Add another hoarder to the list. I am not far from where you live. I would of loved to shop your Purge Sale! I’m drowning in stuff as we shuffle two adult children in and out – I’m having a sake soon! so I appreciate all your tips! i was just filled with sadness that i wasn’t there. i’d have spent a lot of money. You had to have read my mind over all those miles – my final day of work is tomorrow and from Friday until the 4th of July we will be putting all items into the garage for a big sale July 5th. We always have great luck around holidays becase more people don’t have sales then (less competition) but everyone will hit a sale or two as they leave town. I was just trying to think of a catchy title and I’m going to steal yours! Our last blow-out sale was in Labor Day weekend of 2011 where we made over $2,500………..I can’t wait to have this one. I do all the things you listed except I LOVE early birds with flashlights – they have lots of money and I will take it! They only other thing I recommend is to give something away. It has to be big and usable – that draws people in from everywhere! One year we gave away a Queen Sized box springs and mattress that was still in the plastic wrap but in our state once it is out of the store, it’s considered used and you cannot sell it here – so we gave it away. Another year we gave away 9 sheets of pegboard. We also tell Teachers of special ed kids to come take away all our stuff animals for free…….it always causes traffic jams in our cul-de-sac but we let our neighbors know and they just set stuff out to make money. My best buy? A 10 ft. high 12 ft. long solid wood dining room credenza (it was in 2 pieces but when stacked correctly was that big) that was sold to us for $5. Yep, $5. But we had to take it away………2 sons and our pick up bed did the job. We used the 2 pieces separately for years in 2 different areas of the house – the top piece was our grandson’s closet. We sold it together in the 2011 sale for $500 and the guy who bought it nearly fainted with joy………apparently it originally sold for $7,000. Best buy ever! Bought, used, profited! Great ideas and thanks for the inspiration! I saw some treasure that I could use but, I’m pretty sure we don’t live close by one another. I have so many antique shops to visit once my husband and I get settled into our new home up north. I love rummaging through vintage stuff. I’m so excited to find MORE treasure to compliment our home. My last shopping adventure I scored a basket similar to the one you have posted above, a heavy wrought iron/wooden terra cotta pot wall hanger and a mini aluminum colander. Big score! Great tips, Kelly! I need to have one of these in Maine this summer. OK, this site is Great! I mentioned it on my blog. I hope it’s not a problem. Glad you had a good sale. Good thing I wasn’t there. I’ve banned myself…. Emma and I are planning one in about a month. I am stealing your ad. Genius. Hope you made loads of cash. My best buy was a gorgeous vintage 12 place setting china (just a few pieces missing) with 14 K gold trim and roses (75 pieces) with serving pieces and tea pot, creamer, sugar bowl for $15. I resold it to a local shabby chic store for $120. I didn’t need it, but couldn’t pass up the good deal. She thought she got a good deal too. I love this! i’m totally stealing some of your lines to advertise my yard sale coming up!! thanks for the tips. I love garage sales but I love to shop them. I find the best and most unique things, I just bought a double seated( wide enough for two students to sit next to each other) very old ( 1920’s) school desk with a built in bench for $10.00 and I just love it. I live in a rural area and really, a garage sale would not do well here. I’m not a fan of people trampling all over my property. I once lived in a neighborhood and had a moving sale in January and did really well. I love your garage sale, looks like it was a blast. The only thing I question is your price tag–was that $12, $2, or $20. Annoys me when tags aren’t clearly marked. Otherwise I’d drive quite a distance for your sale. 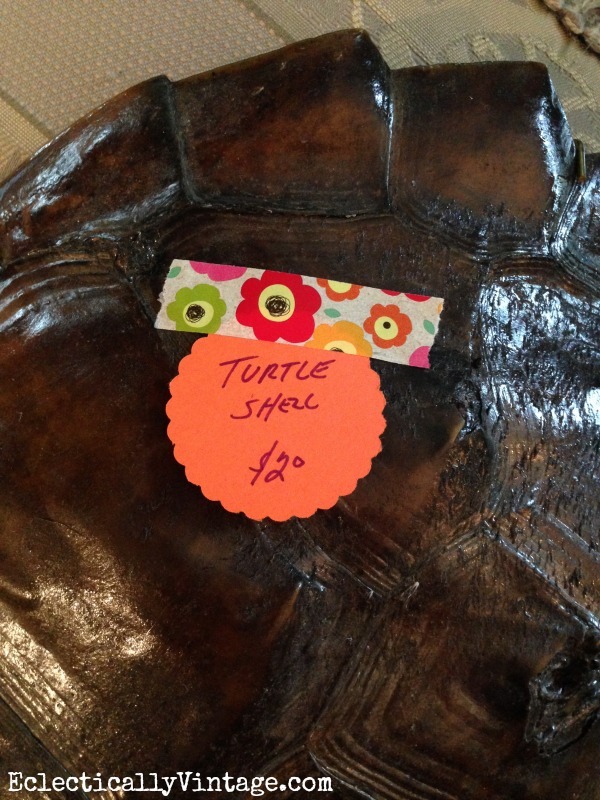 You asked the best thing we ever bought at a yard sale? It has to be the miniature horse we bought at a yard sale in California. He was the sweetest little guy ever (31 inches tall) and he lived till he was 27. He lived every day of his life with us being adored and pampered, he just passed about 6 months ago, so he is still greatly missed. I bought a cane rocker recently for $15. It has to be cleaned up and a small section needs repair otherwise its great. Best. Buys……kitchen aide stand up mixer for $1… yes $1. Set of 6 plates for $15. Resold for $1200. $1! That is the score of the century and of course that amazing profit on those glasses! the best thing I ever scored was a SOLID OAK dresser for $20!! I buy to sell, I admit it. I go to 10+ garage sales every week. I would like to add to your suggestions on advertising. If you put a sign at the end of your road, don’t bother with address just have a big arrow! And if you are more then a mile down that road you need more signs, other wise I’m going to give up! When advertising in the paper or online, give your address! Most of us use gps and just telling us your neighborhood name, or that you are behind some Pizza Hut, just doesn’t help. If you say you are opening at 9, open at 9… Not earlier or later! You’d be surprised how often people advertise without times, dates or directions. Keep it simple, direct and to the point. Don’t say you have antiques if you’ve only got one single plate that gramma hand painted. Be truthful, and considerate of our time. And frankly, a garage sale is not the venue to sell your antiques at antique store prices. Keep it real, we are looking for bargains,! If not, we’d just go shop retail! Wow you know your yard sales! I agree – make it easy for people to find and price it right! Everyone loves a bargain and sellers love getting rid of clutter. It’s a win-win! 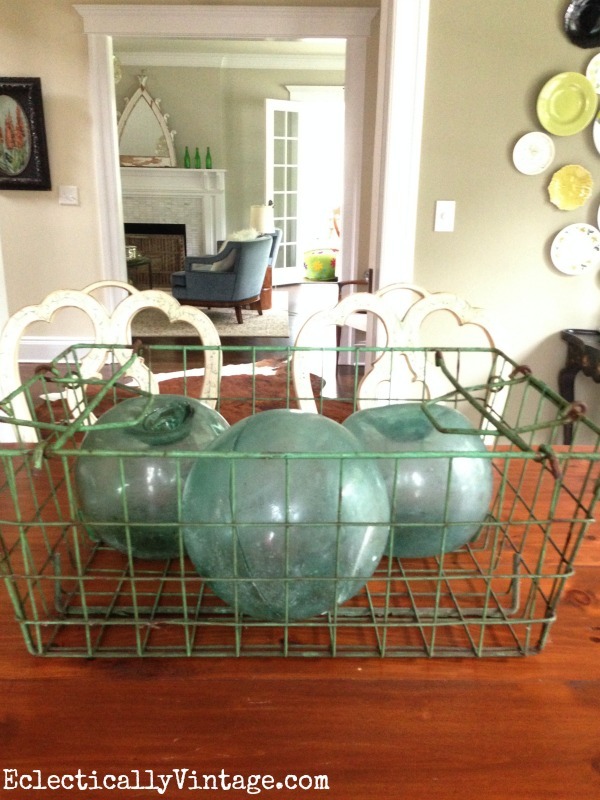 Best thing I ever scored at a garage sale was a wrought iron bakers rack. I paid $25 for it about 20 years ago. I use it outdoors to display seasonal flowers in pretty ceramic pots. Great find – and glad to see you’ve enjoyed it for so many years! Thanks for sharing! i like the idea about setting the mood! It makes it not so awkward when there is music and food! 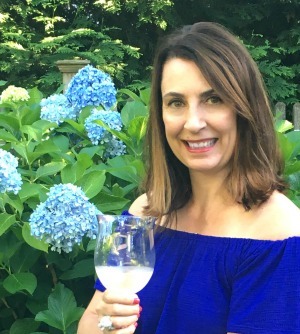 You’ve inspired me — thank you! 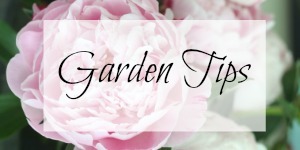 Nice tips….went to a sale once. Bought a used winter coat and found 20.00 in the pocket. Score!